During one of my shopping trips to Michaels, I picked up a couple of Magic Grow Dino Eggs at a cost of $2 each. This version of the popular Grow-in-Water Toys is a realistic looking egg with a plastic dinosaur inside that magically grows when submerged in water. 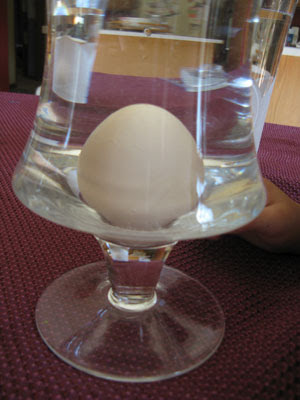 Procedure: Remove egg from package and submerge in a container of water. Day 0: The egg sinks to the bottom of the container as it takes on water through the small holes in the shell, releasing air bubbles on the way down. 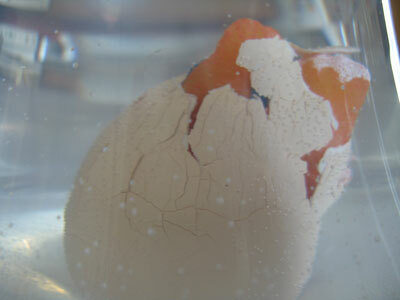 Day 1: As the dinosaur slowly expands it pushes against the inside of the egg, and the stress causes the eggshell to fail along the preexisting, manufactured crack lines. 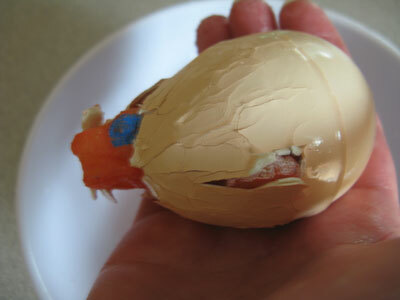 The dinosaur breaks through the shell after 24 hours. The dinosaur is made of a superabsorbent polymer that absorbs a large amount of water relative to its size. As the polymer absorbs water it expands, putting stress on the thin wall of the shell (the shell is also designed to fail at specific points and even seems to break apart somewhat in water). The dinosaur's head "magically" emerges. This activity tested my children's patience. 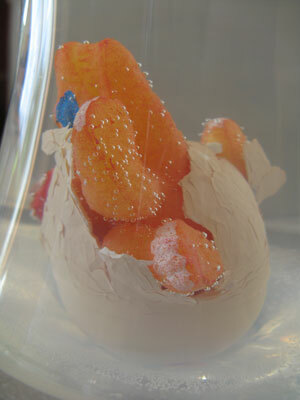 Each morning during the experiment they would wake up and eagerly view the progress of the dinosaur hatching. They were very excited to find that each of their dinosaurs was a different color and shape. The variety surprised me as well, as I did not realize the dinosaurs were different when I bought them. The dinosaur's texture is rubbery and a little slimy and my kids were a little hesitant to touch their dinos. We changed the water several times during the growing period because it became cloudy from various particulates breaking off the egg and dinosaur. After we removed the dinos from their eggs we placed them in a bowl of water so they could continue growing for several more days. Later, after we removed the dinosaurs from the water, they slowly shrunk back to a smaller size as the water evaporated. If I were to try out this experiment out again, I would have the kids measure their dinosaur after we removed it from its shell and continue the measurements every 12 hours as the dino grew in the water. I would also have them record how long it takes for the dino to shrink back down and the final, baseline size so that we could calculate the percentage of expansion. This is my first attempt at participating in Science Sunday. If you enjoyed this post you can find more science experiments involving kids at http://adventuresofmommyness.blogspot.com/search/label/Science%20Sunday and even join in the weekly meme if you like! We have bought those types of toys before, but I never thought much about the science behind the whole thing. Interesting! My kids don't have much patience waiting for things like that either. That is very cool. We are going to be studying dinosaurs this week too. I might need to go check out Michael's! Very cool! I've never tried those before, but I bet my kids would enjoy them! I like your thoughts about measuring them as they grow, and shrink. We've bought several things like that as well, but never found a dinosaur one. That's super cool. Fun idea! I was browsing the dollar store yesterday and thinking how funny it is that I look at everything so differently now that I am trying to use things as teaching tools or blog fodder. I was wandering the toy aisle thinking, "hmmm, what could we do with this stuff." Like we bought a $1 halloween skeleton decoration, because I thought, "ooh, this will help us learn about bones." Anyway, love your idea/post. Welcome to Science Sunday (I've only participated once or twice so far). that is so neat. 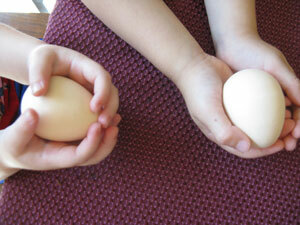 I am hosting my Round Robin this week if you want to join in..
We did this at our house too. Our four-year-old loved it! THanks for coming back and linking up.. I hope you have an amazing weekend..